New York—Sotheby’s presents the opportunity to acquire one of the rarest and most highly-coveted film posters in existence: an original 1932 film poster for the horror classic The Mummy starring Boris Karloff. A seminal example of the graphic design pioneered by Hollywood studios during their ‘Golden Age of Horror’, this stone lithograph will be offered in a single-lot, online-only auction this month. Bidding is now open and will close on Halloween, 31 October. The present poster last sold at Sotheby’s New York in 1997 for $453,500 - at the time marking a world auction record for a single film poster, a title it held until 2014. The Mummy reemerges at Sotheby’s this month with an estimate of $1/1.5 million, which would once again earn it record status. Sotheby’s will exhibit the work in their New York galleries from 14 - 18 October. Designed by Karoly Grosz, Universal’s advertising art director, the poster is an early representation of the aesthetics that continue to influence poster design to this day: vivid, painterly splashes of color, a dynamic composition, and minimal white space. Depicting Boris Karloff in the title role that cemented his place as a film icon, and Zita Johann, the subject of his mummy’s desire, the poster was exclusively created for theaters’ promotional purposes and never made available to the public. Given the ephemeral nature of posters from this era — most were pasted over or discarded after a film’s run — The Mummy poster on offer is incredibly rare: it is one of only three examples known to exist and remains in its original, unbacked state. After setting the auction record at Sotheby’s in 1997, the present example was included in the 1999 exhibition ‘The American Century: Art and Culture 1900-2000’ at the Whitney Museum of American Art. Among collectors, the posters for horror films of the 1930s are revered as the most desirable of all. This period, known as the ‘Golden Age of Horror,’ ushered in a new genre of cinema and approach to marketing movies. As silent movies gave way to ‘talkies’, horror films employed all the latest technological innovations to craft movies that shocked and provoked. Universal set the template for horror as we know it with a trio of films: The Mummy, Frankenstein and Dracula. These movies tapped into the fears and societal unrest between the World Wars, using Hollywood magic to transport audiences to fantastical worlds where good fought evil. Posters from this era played a key role in horror films’ impact, defining the images that would haunt audiences and loom in the cultural memory. Released ten years after the discovery of King Tutankhamen’s tomb, The Mummy is not only an emblem of cinematic history but a relic of popular culture from the time. The film married the vogue for all things Egyptian with the allure of the supernatural, providing a snapshot of the nation’s interests. 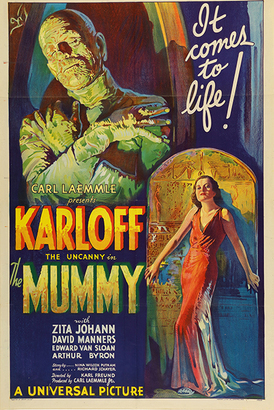 The Mummy was unique in utilizing ambiance and aesthetics to create a sense of foreboding, rather than relying on thrill-inducing gimmicks, which makes the poster such a landmark piece of design. Undoubtedly one of the finest posters produced during this groundbreaking era in Hollywood, and the single best-preserved example to ever come to market, The Mummy is an invaluable cultural artifact.